1. Where is the reserves page for my course? 2. Where do I go for print/physical reserves? 3. How do I access E-reserves? 4. How are the materials organized? 5. How can I re-organize the materials? 6. My course has a lot of items. How can I find one quickly? 7. The screen is too crowded because of the Sakai toolbar. What can I do? 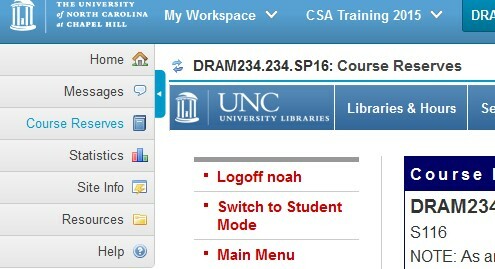 Step #1 – Log on to Sakai and select the class for which you have been assigned a reading. If your course does not have a Sakai page, you can access them by clicking on Access Course Reserves on the library homepage. 2. What kinds of materials are on reserve? When looking at the list of reserve items for your class, you will see that each item has an icon. 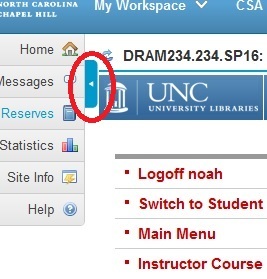 These icons designate whether the item is a PDF, an article, or a physical copy available at a UNC library.
) indicates that the item is a physical book or article that can be checked out at a UNC library. 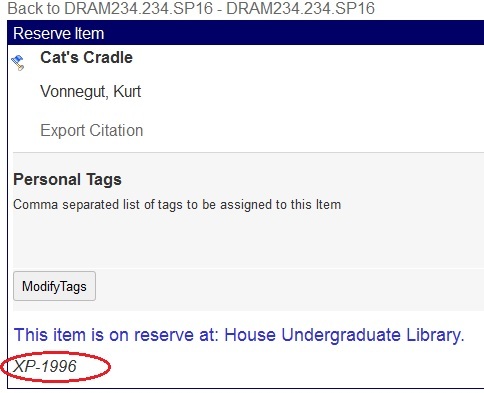 To find out how to locate this item at the library, select the item from the list of reserves by clicking on the “Show Details” button on the left-hand side. Once you have selected the item, you will come to a page that tells you the item’s location. 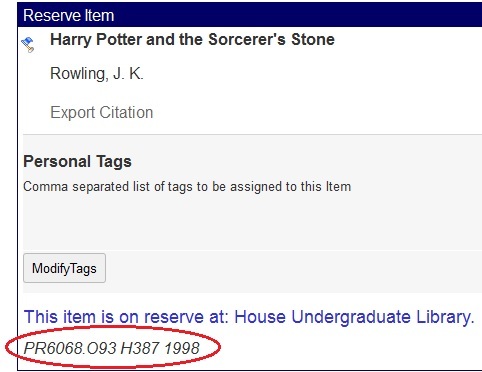 This page will show at which library the item is on reserve and the item’s specific location within the library, which comes in the form of a call number. In this example, it’s the House Undergraduate Library, although there are other locations such as the Media Resources Center, the Art Library, and the Music Library. The call number is important to finding your book – to make things easier, write it down or take a screenshot of it on your phone before heading to the library! Once at the library, use this call number to search for your book. Note: Unless otherwise noted, all reserves items in the Undergraduate Library will be found in the Reserves Reading Room! In some cases, the item you are attempting to access will be held in a location other than the Reserves Reading Room. These items are marked by a different call number. All items marked with ‘XP’ will be held behind the Circulation Desk at the Undergraduate Library. In order to obtain these items, give this XP call number to the librarian at the desk and they will be able to grab it for you!
) indicates that the item is a PDF version of the book or article. To access this item, click on “Show Item” in the leftmost column. This will open the PDF in a new tab. If you have been assigned a specific chapter or article, please note that all reserves items are categorized by the title of the book or journal that they come from, rather than the chapter or article title. Chapter titles will appear beneath the book’s title, and articles will appear beneath the journal’s title. In the picture below, the reading “Britannia Rules the Atom” is listed below the title of the book it comes from, The Journal of Popular Culture. When viewing reserves items, you have the ability to sort the items. 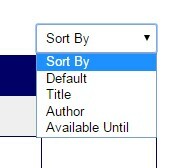 To do so, go to your course’s Library/Reserves page and find the sorting drop-down box. 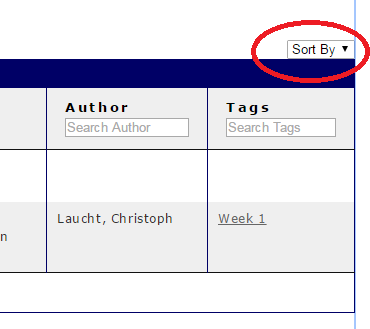 From there, you can sort by the items’ titles and authors. To sort the items by one of these categories, simply click on the option you would like. There’s a search bar at the top of every column on the page listing the materials. You can search by Title or Author. There’s a way to minimize the Sakai toolbar, which will provide access to the full screen. Look for the small blue tab toward the top of the toolbar (circled below). Click on it to minimize the Sakai toolbar.